This is a pretty basic pattern. I wanted something I could adapt pretty easily. All hand towels are not the same width and I didn't want to get caught up in trying to have an exact amount of stitches for the first row. 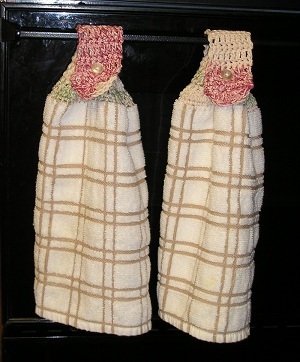 The towels I've used are usually about 16" or 17" wide. I have always used cotton worsted weight yarn - mostly Sugar 'n Cream. I like how it holds up and I sometimes make a matching potholder. I cut the towel in half and sew a 1/4" inch hem across the cut edge to help prevent raveling. I then do a blanket edging across the hemmed edge. This is how my edge looks. Remember to leave a long yarn end on both sides so you can weave it in to your crochet stitches. sort of like a tassel, but it didn't look so nice after a few washings. My stitches are somewhere between 1/4 and 3/8 of an inch. insert the hook in the first loop formed by the blanket stitch. Work a single crochet in that loop and all the remaining loops. I have had as few as 47 stitches and and as many as 58. It all depends on the width of your towel and the spacing of your blanket stitches. Ch 2 and turn you work. Row 9 thru 16: Repeat rows 7 and 8. Row 20: (do not chain) sl st in first sc, skip next 2 sc, 4 dc in nect sc, 4 dc in next sc, skip next 2 sc, sl st in last sc. Fasten off.